Native 16:9, Back-illuminated Exmor R CMOS sensor. Sonys back-illuminated Exmor R CMOS sensors are well known now for low-light sensitivity, image clarity and drastically reduced noise. Infrared NightShot® (night vision) filming and photography. The HXR-NX70U incorporates an IR illuminator that produces moderate levels of infrared light, enabling effective night time imaging under low light conditions. The resulting images are typically higher resolution than other night vision technologies. GPS Geo Tagging A built-in GPS receiver allows viewing the HXR-NX70Us current location coordinates on the LCD display, as well as "tagging" the clips with shooting locations. The receiver gives the ability to "tag" shooting locations as a future reference if it is necessary to return to the same location or to create a log of areas covered when surveying remote locations. Additionally, the receiver automatically adjusts the camcorders clock to the proper time zone when international travel is part of your assignment. Locations can be tracked on Google maps and all GPS data can be extracted with a PC. Direct Copy to external HDD without PC. 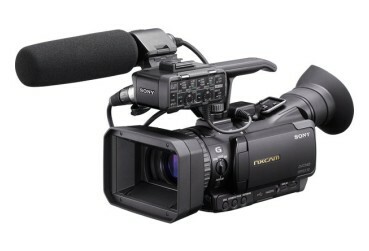 As other Sony NXCAM camcorders, it is possible to "field backup" entire cards or important shots by copying footage directly from your camcorder to an external USB hard disk drive; all without the need for a computer. The HXR-NX70U can also access clips stored on the external hard drive for playback on a monitor, allowing utilizing the camcorders powerful playback indexing features. Recording Media 96GB internal flash memory. 96GB equals 96 billion bytes, a portion of which is used for data management functions. Recording Media 96GB Flash memory. 96GB equals 96 billion bytes, a portion of which is used for data management functions.